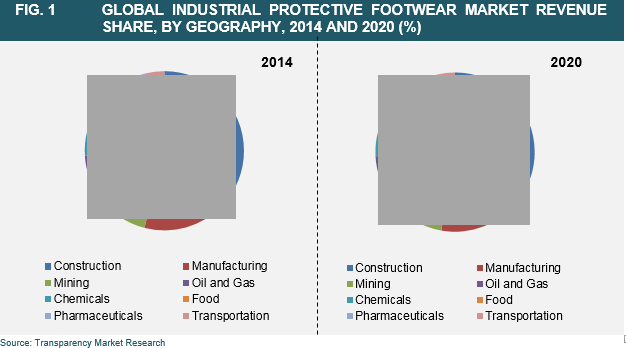 According to a new market report published by Transparency Market Research “Industrial Protective Footwear Market - Global Industry Analysis, Size, Share, Growth, Trends and Forecast, 2014 - 2020,” the industrial protective footwear market was valued at USD 6,317.7 million in 2013, which is expected to reach USD 9,460.6 million by 2020, growing at a CAGR of 6.0% from 2014 to 2020. The demand for safety shoes is expected to shift from mature regions such as North America and Europe to emerging markets in Asia Pacific and RoW supported by China, India, Japan, South Africa and the Middle East among others. This is due to the increasing regulatory actions in these regions with increasing support from International Labour Organization (ILO). Occupational safety and health legislation in many countries mandate the use of safety boots in industries. At present, these regulations across regions such as North America, Europe and Asia Pacific are fueling the demand for safety footwear. In addition, with the increase in number of worker accidents, the adoption of protective footwear is increasing. Worker safety issues are being addressed and industrialists are focused on improving the safety standards owing to which there is an increase in the demand for safety footwear globally. Geographically, Europe dominated the market in 2013. North America closely followed Europe with a significant market share. Presence of large number of safety shoe manufacturers in countries such as Italy, Germany, France, Spain and UK among others is positively supporting the market in Europe. For example, Italy has a larger number of key market players such as Jal Group, Giasco, Safetal, Siili Safety and Sofra among others. In addition, stringent regulations related to the mandatory use of safety footwear are responsible for the growth. In North America, the demand is increasing due to strict legislations coupled with the growth of niche markets. Asia pacific and RoW is majorly supported by growth in countries such as China, India, Taiwan, Korea, Brazil, South America and Africa among others. These regions are expected to have high growth during the forecasted period. Jal Group, Rahman Group, Oftenrich Holdings Co. Ltd. (Golden Chang), Honeywell Safety Products, Saina Corporation Co. Ltd., VF Corporation, UVEX Safety Group, Rock Fall Ltd., ELTEN GmbH and COFRA Holding AG among others are some of the key players in the industrial protective footwear market where, Jal Group dominated the market in 2012.